"How do you work with them?" "I'd rather scoop maggots off a corpse than deal with a spider." Those are some of the typical responses Rick Vetter hears when he tells people about his work as an arachnologist at the University of California, Riverside. "It doesn't matter if I say they're beneficial, many people just want them dead," said Vetter, a retired research associate who spent 32 years in UCR's entomology department. "Even some of the entomologists I've worked with are incredibly afraid of spiders." 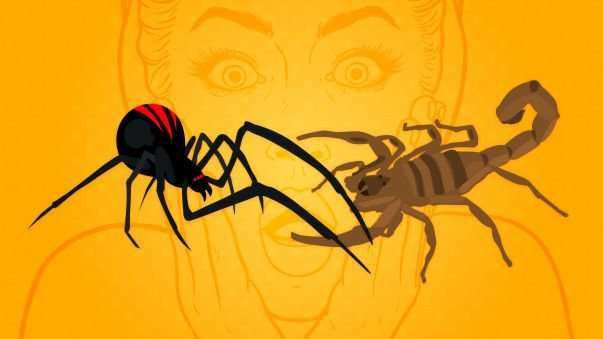 Spiders and snakes reign supreme in the world of animal phobias, but the evolutionary reason for spider fear isn't well understood. Some psychologists believe it has an innate foundation, since humans may be genetically programmed to fear animals that can cause them harm. But such visceral reactions to spiders have always intrigued Vetter, who said most of the long-legged arthropods are "easily squishable" and few are harmful to humans. Even those that bite often leave nothing more than a pinprick at first, with more severe symptoms developing hours or days later. The danger of spiders pales in comparison to another member of the arachnid family: scorpions, whose venomous stings cause immediate searing pain, severe reactions, and sometimes death. "In terms of innate fear, scorpions would be a much better candidate for aversive reaction than spiders. But as an arachnologist, I rarely hear about peoples' fear of scorpions," Vetter said. "Nor do scorpions enjoy the same monster-like status in popular culture." With this in mind, Vetter and colleagues from five universities across the U.S. set out to study fear of spiders and scorpions among 800 students in Green Bay, Wisconsin; Cookeville, Tennessee; Athens, Georgia; Tucson, Arizona; and Riverside. The Wisconsin site is the only location devoid of scorpions, while the Arizona location is the only one to host a potentially deadly scorpion, Centruroides sculpturatus, commonly known as the Arizona Bark Scorpion. The researchers used the well-known "Fear of Spiders" questionnaire, which they adapted to measure fear of scorpions. The participants were asked to agree or disagree with statements, such as, "If I saw a spider now, I would leave the room," and "Spiders are one of my worst fears." The scientists predicted spider fear would be higher than scorpion fear overall, with students in Arizona being the most fearful of scorpions, and those in Wisconsin the least fearful. Published today in the non-peer reviewed "Musings" section of American Entomologist, the results surprised them: respondents from all locations reported being more fearful of scorpions than spiders. "The results from our survey blew our predictions to smithereens," Vetter said. "Not only were people more afraid of scorpions than spiders at all universities, but scorpion fears in Wisconsin were equal to or higher than scorpion fears in Arizona. That fact that students in scorpion-free Wisconsin registered such high fear scores is mind boggling." Vetter said it's possible that exposure to arachnids leads to habituation and therefore lower scores, which might also explain why scorpion fear was low among Arizona students. "Are high scorpion fear scores in Wisconsin due to fear of the unknown and the unfamiliar?" said Vetter, who said the paper's inconclusive findings open the door for psychology researchers to explore scorpion fear, which is much less studied than spider fear. "By adding scorpions to the research mix, psychologists might be able to get a better understanding of arachnid fear in humans," he said.